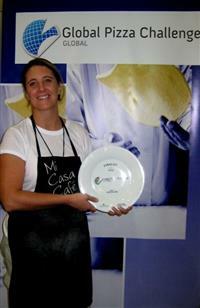 In March 2009, Odette Williams, owner of Mi Casa Café, Sodwana Bay, walked away with the inaugural Global Pizza Challenge (GPG) 2009 title. Now she has the opportunity to present her winning South African pizza at the GPC International Final, to be hosted in Melbourne, Australia, on 15 May. In March 2009, Odette Williams, owner of Mi Casa Café, Sodwana Bay, walked away with the inaugural Global Pizza Challenge (GPG) 2009 title. It was Williams’ coconut and chicken concoction that won the hearts of the South African Chefs’ Association endorsed panel of judges; and now she has the opportunity to present her winning South African pizza at the GPC International Final, to be hosted in Melbourne, Australia, on 15 May. The Australian Chefs Federation (ACF) will be the officiating culinary body for the grand international finale. The esteemed panel of judges includes: GPC Founder, Chef Glenn Austin; Past President of the ACF, Peter Wright; Honourary Past President of the SACA, Chef Martin Kobald; Vice President of the SACA, Chef Arnold Tanzer, as well as two board members from the World Association of Chef Societies (WACS). Williams will be pitted against six competing countries, and afforded 30 competition minutes to recreate her Coconut Chicken pizza. The overall winner of the challenge will be crowned the Global Pizza Champion and walk away with a certificate and $2 000 Australian dollars. Entries have already opened for the GPC 2010, to be staged at Hostex, Cape Town, in March this year. With international ingredient and equipment sponsors such as Fonterra and Prenox onboard; local license holders Kobald and Tanzer are hoping that the competition will take root and flourish in Namibia; the United Arab Emirates; China; Thailand; India; and New Zealand - to name but a few new territories earmarked in 2010 for the brand. For more information, visit www.globalpizzachallenge.co.za.